During the summer weekends in this gulf there are always numbers of yachts, motorboats, dinghies and boats of all kinds. In the few hours between breakfast and lunch, what looked like a body of water capable of containing a pod of whales, becomes the anchorage of a disorderly crowd of Sunday sailors. Before spending a few hours on this small unnamed beach between Viticcio and Punta Peninsula, this rally was incomprehensible to me, but not anymore. In a previous post I described the largest bay on the island which takes its name from a place more or less in the centre, Procchio, in its eastern part, with a number of other bays, for all purposes of the “sub-bays” , amongst which two are memorable because of the number of hotels and apartments which are the most sought after on the island: they are Forno and Biodola. Another of these “gulfs in the gulf” is Viticcio, a place that has some small beaches, each one different from the other. The one at the most western point can be reached easily only by sea , otherwise there is a walk along a stretch of cliff of about 200/300 meters west of the town, but only do it if you are in good shape as there are also sections where you have to climb slippery and jagged rocks. Don’t do it in the months of April-May and until mid-June, because among these rocks there are many gulls nests and they don’t like human visitors, the adults are irritated and the chicks frightened, and as a consequence they may fall in the sea which happens every year. If somehow you do arrive at this beach, you’ll discover why there is recreational crowding, this gulf in addition to being well protected is … beautiful! And I believe that it is the extraordinary beauty of the place which attracts small local boats alongside the mega tourist boats. The Mediterranean vegetation goes down to a few meters from the sea and the reef is never steep and severe, and the sandy sea bed isn’t deep and it’s covered by a vast prairie of Posidonia. To the east the Gulf is enclosed by the Enfola peninsula, with its distinctive mound in the middle of the sea, while to the west you can see the imposing Monte Capanne, preceded by a series of verdant hills, as if they were wings of a natural theatre. A quick glance is not enough to appreciate the complete beauty of this beach, so you should get lost in the details, and start to put the pieces together. Something you can’t find in the supermarket. 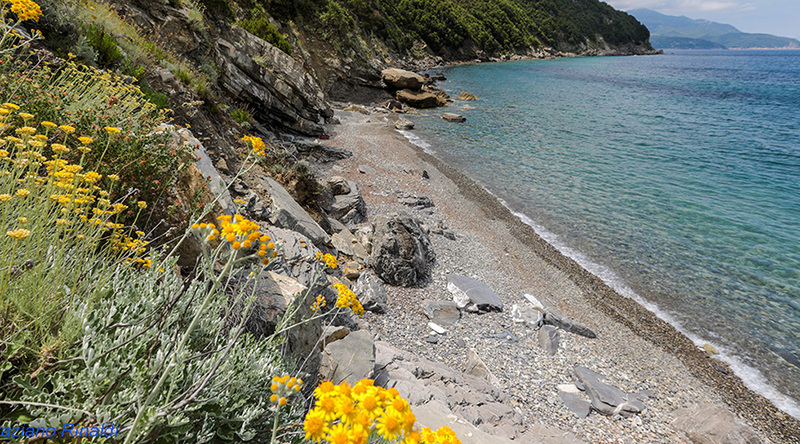 First of all, the cliff is capped by the golden yellow blooms of cineraria and everlasting, then shrubs and trees of the Mediterranean that fit their bodies to the winds of the sea in which they are exposed and give off a scent that you will not find in any store, because the resin planst mix with the salt and the endless smell of the sea. Then there is the arrangement of rocks, gently but decisively supporting the short coastline with a skilful hand which the mountain of Elba, a giant pluton, disrupted when it emerged from the sea. 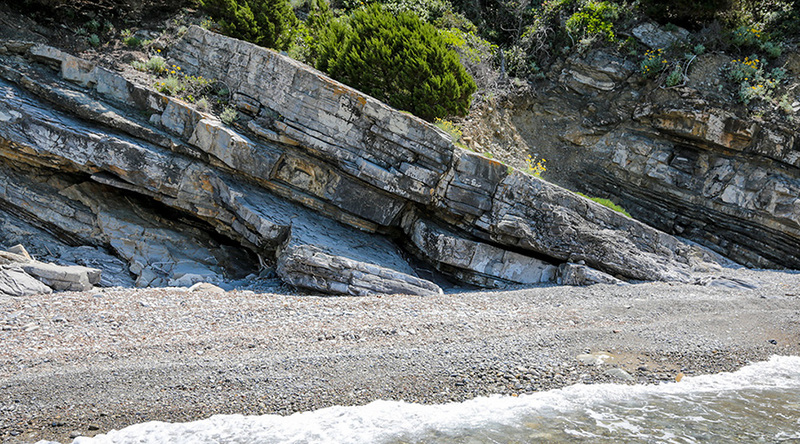 If you arrive by land, you will notice that before arriving at the beach, you have to walk along a stretch of smooth dark gray rock, which also forms the stacked layers appearing at the back of our beach and that give the primitive beauty that is felt immediately. This derives from ancient sediments of “sludge” in the ocean, originated on our planet when the dinosaurs dominated. In some places the granite from Monte Capanne peeps out, that which has been pushed up and was geologically much older, creating that wonderful chaos that you will love more than any human order. It’s a small relatively new beach, there is almost no sand, but generally consists of small and large pebbles, they all come from the relentless sea working against the sea cliff. If you like the endless forms of nature you could pass the summer to observing the veins that run through the rocks smoothed by the waves. There are always many boats a few meters from the shore, sometimes noisy, and always equipped with engines that do not smell of lavender. They do take away some of the charm to the place, but with the same speed with which they came, they will leave and our small beach will welcome back the gulls and the other inhabitants of the uncertain border between land and sea, as it has for thousands of years and will continue to do despite our occasional and massive presence. If we could find pre-scientific idea of ​​sacredness of the place, we should attribute to this quiet, small beach a very high value, at very least taking into account the millions of years that it took to appear in its current simple magnificence.